Proudly carrying the title of being the first legal casino opened outside Nevada, Atlantic City's Resorts is one of the first to offer casino and sports betting in the State of New Jersey, too. Resorts offers to match a player’s first bet up to $250. Whatever value a player places on their first bet, Resorts will load the equivalent up to $250 into your account for use. Additionally, Resorts offers a bonus on top of multi-leg parlay bets. Any parlays with 5 or more legs will have a percentage of your winnings added onto the successful bet, up to $25,000. Resorts was later to the online game than some other New Jersey sportsbooks, but the iconic Atlantic City casino made their online sportsbook debut in late January of 2019. The new Resorts online sportsbook is powered by SBTech. The two companies signed a partnership back in July on 2018 that would allow SBTech to operate Resorts’ in-person and online sportsbooks. The result is a sportsbook that seems familiar, but uniquely Resorts. The blue tones used help to keep the book easy to look at in all lighting circumstances. There are menus all over the place that can be slightly overwhelming for first-time users, but becomes easier to understand after a closer look. Landing on the home page of Resorts Sportsbook leaves players on the live betting page. From there, all available markets are available for players by using the menus on the left side of the page. The active leagues are highlighted at the top of the left-hand menu. For those more used to European odds, there is an option to change the odds format on the top of the bet slip. Selecting a bet will cause it to appear in the bet slip. The bet slip keeps all individual bets compact, but concise and easy to look at. One slightly sticky function is a separate tab for single and parlay bets, as well as round robin bets. A chat function appears at the bottom of every page to make it easy for players to contact a Resorts representative should they require assistance. 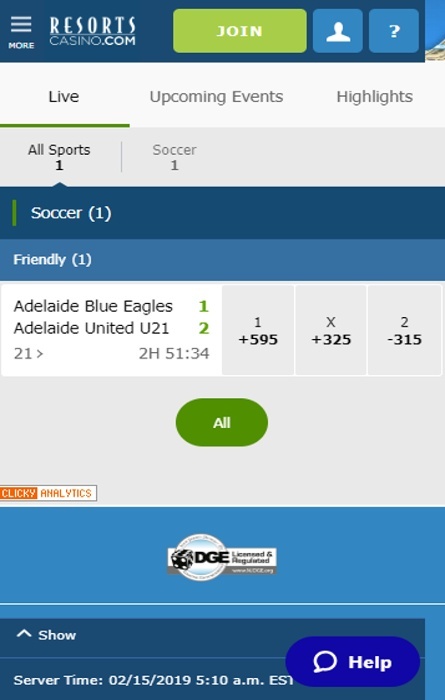 For players that wish to see more betting options on a specific game, they can select a game to view more betting details on it. 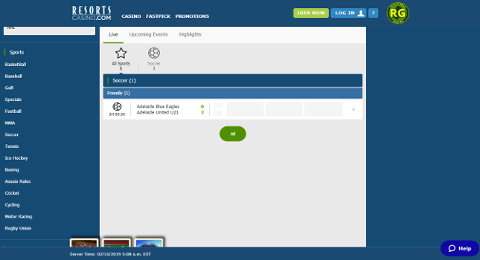 If it’s a live event, a Match Tracker and associated stats will appear on the right side of the page to help bettors inform their choice. Resorts offers all major American sports, and some more niche sports that players won’t necessarily see at other US sportsbooks. Football, basketball, baseball, hockey, and soccer are all represented, with odds on multiple leagues per sport. Soccer offers all major European leagues, as well leagues down to Austria 2nd Division, Belgian First Division B, and AFC Cup Qualifying. Basketball as well, offering Champions League and Euroleague odds. Additionally, Resorts offers Australian Rules Football, boxing, cycling, golf, MMA, motor racing, rugby, tennis, and various special odds. At the time of this review, the special odds were focused on the Academy Awards. One drawback is the lack of horse racing to bet on. Resorts does have a mobile app, but it currently does not support sports betting. The same goes for their mobile site. Resorts online casino isn’t as new as the sportsbook, launching back in 2014. The casino side of things is helped along with the name power associated with Resorts, which is the first casino to open outside on Nevada in 1978. For new players, Resorts offers up to a 100% match of a player’s first deposit up to $1,000. There is a pretty big wagering requirements, however. For slots, it’s 30x. For table games, roulette, and video poker, it’s 150x. Resorts is powered also powered by SBTech. Having been on the platform form 5 years, Resorts figured out how to use the platform to the fullest possible potential. There are iOS and Android apps for players to play various casino games. The app is almost identical to the regular online site, with one minor change being a hamburger menu at the top of the page instead of a menu bar like the desktop site. There’s not much else to say about the mobile site and app, beyond the fact that it’s almost exactly the same as the desktop site. What you can do on the desktop site are things you can do with the mobile versions of Resorts Casino. 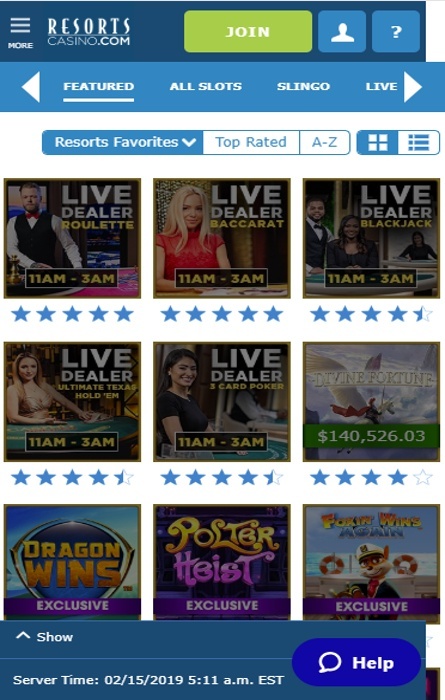 Resorts Casino.com is composed of various blues that makes viewing easy on the eye. 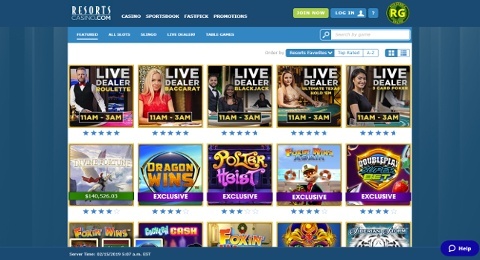 A menu bar at the top of the page allows users to flip between the casino, sports, and promotions being offered. The games are split by a second menu bar below the splash. Players can easily sort between slots, slingo, live dealers, table games, and video poker. Below that, there are hundreds of games for players to pick from. Resorts offers a huge variety of games. Slots, video poker, slingo, and live dealer casino games, almost anything you could want. Most poker options have plenty of variations to keep players interested. Because of the integrated site that includes casino and sports on essentially the same page, it’s very easy for players to go back and forth while betting on sports and casino games. One of the biggest features on the casino side of Resorts is the live dealers, which offers 16 hours of live dealing and several versions of every game offered. Resorts offers a massive 100% match up to $1,000 on a player’s first deposit with Resorts Casino. There are also several daily games for players to take advantage of, advertised as $3,000,000 in winnings available for players. There are also several other seasonal promotions for players to enjoy, from extra spins on the daily games to win some money, all the way up to a free cruise. There are always various promotions for players to take advantage of at Resorts. Resorts continues their long tradition of strong casino offerings with a strong online casino for players to take advantage of. The vast number of options from the casino games and sports betting. Resorts’ new sportsbook will help to catapult them into the new, more legalized age of gambling in the US.